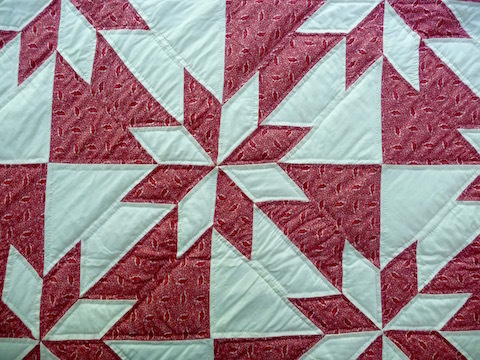 Here is a beautiful Hunters Star quilt in red calico and ivory. It’s pieced beautifully. The lines are clean, however, the more you look the more you see. The quilts morphs according to the viewer’s attention and point of view. Created using three simple shapes (triangles, parallelograms and diamonds) the quilt sings sweetly. Red calico print and ivory fabrics work very well together. The combination is soothing to the eyes. This is a classic pattern and a classy quilt.